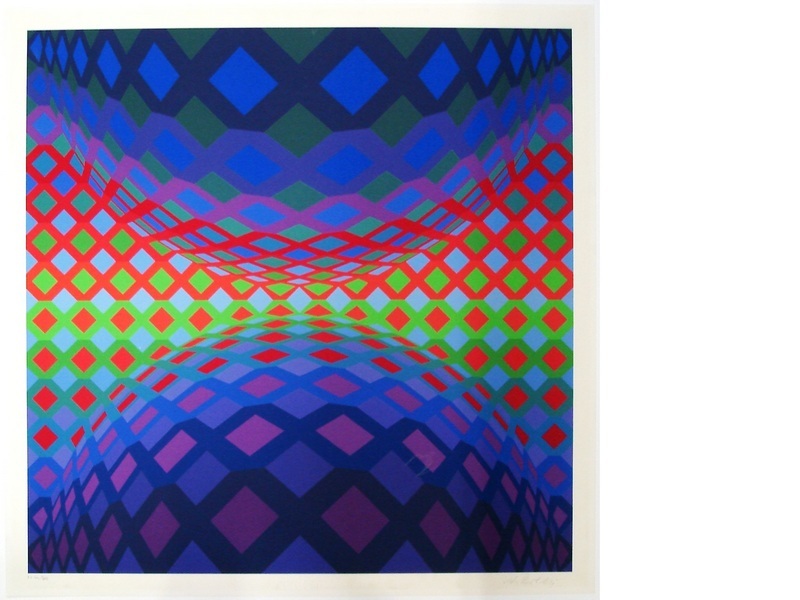 Victor Vasarely (1908 – 1997) was born at Pécs in Hungary. He studied in Budapest at the Podolini-Volkmann Academy, then at the Mühely school of graphic arts run by Alexander Bortnyik in the tradition of the Bauhaus. He moved to Paris in 1930, where he worked until 1940 as a commercial artist, mainly designing posters, with a marked interest in trompe-l’oeil effects, graphic patterns and space illusions. From 1944 he devoted himself exclusively to painting and the same year the Galerie Denise René, Paris hosts his first one-man exhibition. From 1947 he concentrates on constructive-geometric abstraction and in the later 1950s he pioneered Op art (aka Optical Art) with compositions based on a continual aggressive interaction between different kinds of pattern, and invented a plastic alphabet of standardised colours and shapes which could be used in a wide range of permutations and would lend itself to endless reproduction. He gained great fame and received various awards all around the world. In 1970 he founded a museum to show his own work at the Château de Gordes and six years later he creates the Fondation Vasarely at Aix-en-Provence.